Despite many advances in studying cancer, we still use a definition of cancer from the 1850s. 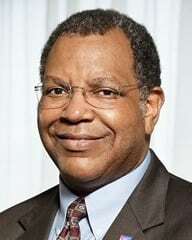 That’s what Dr. Otis Brawley, chief medical officer of the American Cancer Society, told the recent Preventing Overdiagnosis 2015 conference at the National Institutes of Health. As a result, he says, the belief continues that a cancer will kill because it looks like other cancers that spread and killed in the 1850s. He calls this “pathologic profiling” of cancer – and of the people who are diagnosed – based on 160-year old laboratory standards. That’s one of the things we talked about in an interview that is our 5th in a series of podcasts on overdiagnosis topics. Other topics: faith-based medicine is not good science, emotional conflicts of interest as important as financial COI, ideas for health care journalism, and more. Dr. Brawley’s biosketch on the American Cancer Society website.